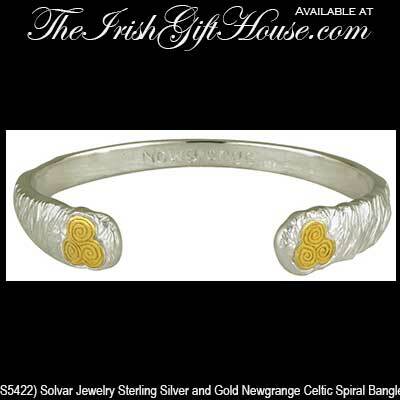 This sterling silver Newgrange cuff bracelet features Celtic spirals with yellow gold accenting. Sorry, this Newgrange bracelet is now sold out. This Newgrange bracelet has been hallmarked sterling silver by the Irish Assay Office at Dublin Castle in Ireland. This Newgrange bracelet is a cuff bangle style that features beaten sterling silver construction along with 14K yellow gold accenting. The Newgrange bangle measures 1/2" wide at the widest area and it will fit most women's wrists. 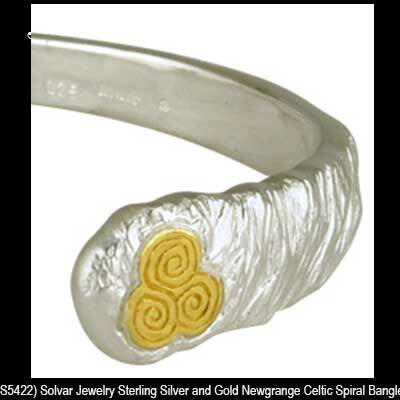 The Celtic spiral bangle is made by Solvar Jewelry in Dublin, Ireland and is gift boxed with a Newgrange spiral information card that is complements of The Irish Gift House.